His Highness the Aga Khan addresses the gathering at the inauguration of the Aga Khan Garden Alberta. For one thing, the old friendships we renew today are especially meaningful. We look back, of course, to the welcome in Alberta of members of the Ismaili community who settled here almost a half century ago, often in very difficult circumstances. And those bonds of welcome have been continually renewed through the years, especially through our rewarding partnerships with the University of Alberta. One of the special gifts that old friends offer is introducing us to wonderful new friends, and that has also happened here. The project we celebrate today – the inauguration of the Aga Khan Garden – is a particularly happy example. I think all of you have had the pleasure – in your personal life or your professional life – of seeing a fascinating story develop happily from beginning to end. We recall the excitement of a new beginning – as well as that deep sense of grateful satisfaction when the planning works – when the hope is realised, and the vision is achieved. Well that is exactly how I feel today. I was fortunate to have been part of this project’s conception – and I feel fortunate to be here today to help mark its realisation. I remember well my visits to the University of Alberta during my Golden Jubilee year – in 2008, and again for the graduation ceremonies in 2009. That was when we first discussed this dream of creating here, together, a new Islamic Garden. I paid my first visit to the proposed Garden site at that time, wondering, even then, just how this dream might come true in practice. It seemed like an unlikely dream to many. After all, the great tradition of Islamic Gardens has its roots in very different times and places. The symbol of the Garden as a spiritual symbol goes back to the Holy Qur’an itself - where the Garden ideal is mentioned many times. Down through many centuries, Islamic culture has continued to see the Garden as a very special place, where the Human meets further proof of the Divine. The development of the Garden as a symbol of Islamic ideals flourished most magnificently some 500 to 600 years ago – and that happened, of course, in the warmer climates of Southern Asia. And yet, there we were in Edmonton a decade ago, proposing to extend that lovely Eastern and Southern tradition, at the start of the 21st Century, to the unique natural environment of northern and western Canada. This proposed new Garden, to be precise, would be the northern-most Islamic Garden ever created. Over the past nine years I have been able to watch the dream come true – as we agreed on the configuration of the site, assembled a Steering Committee, chose an architectural firm, and reviewed development plans. And then, with the planning completed, the building process took just some 18 months – finishing “on time and on budget,” as planners like to point out! As I look out at this Garden today, what I think about – above all – are the people who made it possible - their dedication, their talent, and their remarkable energy. I want them all to know that in celebrating this new Garden today – we are also celebrating them. Theirs is a highly valued gift to the generations to come, who also must be privileged by experiencing the spirituality and harmony of multiple life forms. They include construction workers and gardeners, planners and administrators, artists and scholars, architects and designers – including the landscape design firm of Nelson Byrd Woltz. They include dedicated members of the Ismaili and other Muslim communities in Alberta – and other parts of Canada, the remarkable family of the University of Alberta, governmental officials at all levels, and those who serve the Aga Khan Trust for Culture and the Aga Khan Development Network. At the heart of their efforts, of course, was the inspiring power of the Islamic Garden itself. For a central part of the Garden tradition is the high calling of human stewardship, our responsibility to honor, to protect, and to share the gifts of the natural world. Gardens in this context can be seen not as imitations of Nature but as humanity’s interpretations of nature, their geometric structures providing a human framework in which we can experience – in this case – the magnificent fluctuations of the Albertan landscape. The Garden of Islamic tradition is also a place where the flow of refreshing water reminds us of Divine blessing. It is a place for meditation, and quiet renewal. But I would likewise emphasise that the Garden, through history, has also been seen as a social space – a place for learning, for sharing, for romance, for diplomacy, for reflection on the destiny of the human race. And even as we share the Garden experience with one another, we can feel a connection with those who walked through similar Gardens in the past. I would also mention one additional aspect of the particular Garden we inaugurate today. It symbolises not only the creative blending of the Natural and the Human – but also the beauty of multiple inter-cultural cooperation. One of the great questions facing humanity today is how we can honour what is distinctive about our separate identities – and, at the same time, welcome a diversity of identities as positive elements in our lives. This city and this country have been among the world leaders in providing positive answers to that ancient question. The project we inaugurate today is a beautiful extension of that Canadian tradition. In Canada and in many other places, the Aga Khan Trust for Culture has made a major commitment to creating and renewing important green spaces in recent years. We can look back on ten recent successes in places ranging from Cairo to Zanzibar, from Toronto to Kabul, from Dushanbe in Tajikistan to Bamako in Mali. In 2018 alone, I helped to inaugurate three such Garden projects – in London, in Delhi, and now here in Alberta. But the story does not end here. In fact, the story of Canadian Islamic Gardens itself is not yet completed. Our plans are now advancing, in fact, for a new Park to be developed a few hundred miles southwest of here, in Burnaby, British Columbia. Yes – to be sure – it will surpass Edmonton as the western-most Islamic Garden. But, of course, we can be rest assured, that Edmonton’s Garden will still have a lasting claim as the northern-most! I have talked about the past, today, but I would close by emphasising the future. It is wonderful at a moment like this to think of all those who will visit here in the years to come. Our work now is to sustain this space, to create new experiences and to meet new challenges. As you walk through these Gardens, you will see evidence of the ways in which future generations will be able to make the most of this site. 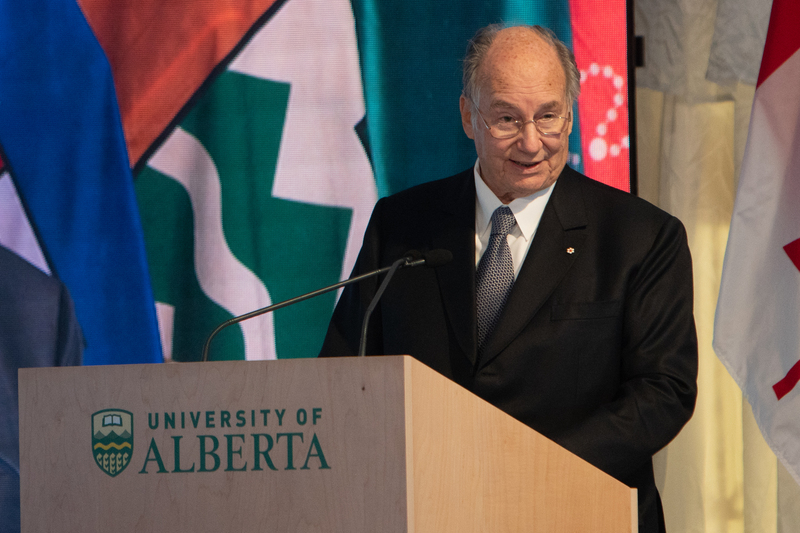 It is our hope and expectation on this special day that the Aga Khan Garden here at the University of Alberta will truly be a gift that keeps on giving.